Its was very well done I am trying it out for dinner tonight. I can’t wait to see out it turns out yours look so yummy. I overcooked this because my boyfriend is weird about chicken and it was still JUICY and beyond that, the rub is completely delicious! Thank you for sharing your epic recipes! YAY! So happy to hear this and LOL on the boyfriend comment! Thanks so much for taking the time to leave a review, Evonna! Thank you for a great recipe – finally I don’t have shoe leather chicken and turkey breasts. 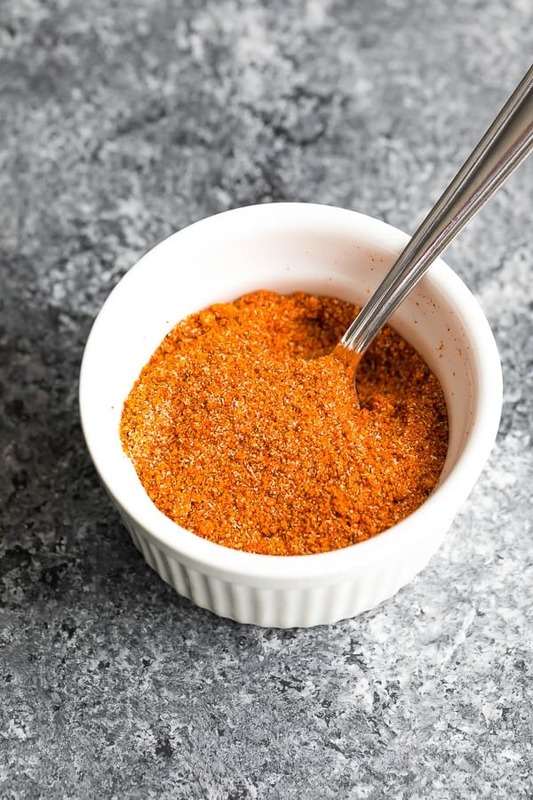 I made my own rub with poultry seasoning – powdered, Italian seasoning, celery salt and parsley, as we’re on a Candida diet and low fodmap – but thanks so much! I just found your website today scowering for new quick recipes for my weeknight meals! Generally, I maybe find 1 or 2 good recipes from a website but with yours its 8 and counting! I love the ease of your ingredients, that they are somewhat healthy, and you use a variety of dishes and flavors but ingredients that I have at my house. I am SO excited to try ALL of your recipes! You’re my soul sister! Thank you very much! I am so tired of bland chicken and have given up on fixing it. I stumbled on your recipe and had an “aha!” moment. This is absolutely to die for! Thank you for a great way to prepare chicken breasts that is both healthy and delicious. I wonder if this method would work for frozen chicken breasts or do you have another method for cooking them? Thank you, Denise! I did use the Instant pot. I had cooked my there’s chicken in the oven before and love the higher temp and quickness to cook most, flavorful chicken. My employer praised me a lot,bcoz i copy your recipe and it was perfect..the chicken breast is so juicyyyyyy!!! LOL! Glad you made a good impression! 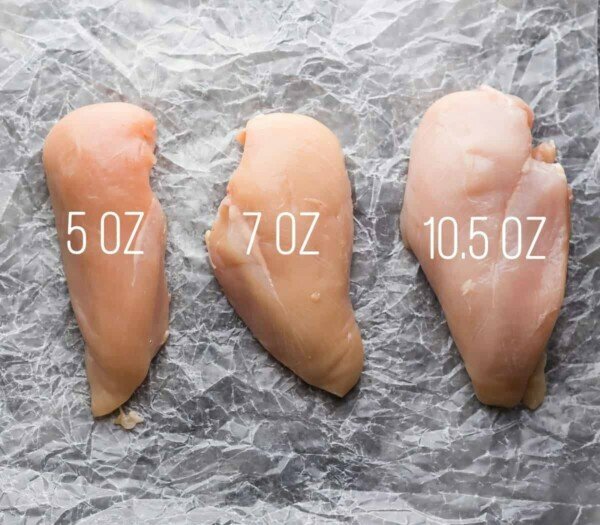 If I am baking TWO 7-ounce chicken breasts at the same time, do I go by the individual weight of each (rather than the collective weight), so bake for 15-20 mins total…or do I double the cooking time because there are two? Sorry – VERY new to cooking! Hello Denise, a wonderful chicken recipe. I’ll try it tonight. So pleased to have found your recipe which I plan to follow tonight. I never have any success cooking chicken breast. Always turns out dry and tough. Wondering if the rub can be applied to the chicken in advance and left in the fridge for a couple of hours before baking? Also, does the chicken go straight from the fridge into the oven without greatly affecting cooking times? Is it better to use boneless or bone in? I have actually never tried this recipe with bone-in. The cook time would almost certainly change…if you try, I’d love to hear how it goes! We’ve made this chicken many times now, and it’s a family favourite for sure. Can I ask though (because I’m terribly lazy) can I cook them in a disposable foil pan? Sure you could do that! I recently made the resolution to take charge of my financial independence and culinary self-reliance. Thus, I chose to start cooking my own meals: I save money, eat healthier, and I’m not dependent on services or constrained by menus. Yours is the first recipe I tried. The simplicity and unpretentiousness of your dishes is what drew me in. I’m happy to say that my first attempt went great, the chicken breast came out juicy, delicious, and perfectly cooked (if I say so myself). But now my sister wants to drive me to the hospital, she never took me for the cooking type and thinks something is seriously wring with me…haha. I’m so happy to hear this, Walt! So glad you enjoyed the chicken. I hope you enjoy some other recipes! Let’s say I’m cooking the 10oz, do I cook for ten then flip and cook for an additional 10-15 (for a total of 20-25)? or do I cook for 10 then flip and cook an additional 20-25? Hi Amanda! Cook 20-25 minutes TOTAL, so 10-12 min per side. So happy to hear this! Thank you for your review, Alexander! So happy you enjoyed, Michelle! Thank you for reporting back! This may be a silly question, but what kind of scale do you recommend buying and using to weigh the chicken or any food for that matter? Hi Michelle! The scale I own isn’t for sale anymore, but this one has amazing reviews! Thank you! When you weigh the chicken, do you put the raw meat directly in the scale? Or do you put wax paper or Saran Wrap on the scale first and then the meat? Can you weigh all types of meat on the scale? I have never used one for cooking. Hi Michelle, I weight it right in the bowl I toss in the oil. So I put the bowl on, tare the scale, then add the chicken. Although I often don’t weigh anymore because I can tell just by looking at them how big they are! I also weigh my flour & butter for baking, which is so handy because you just put your whole bowl on the scale and scoop the flour in, no more measuring cups! This is so moist and great! I did do one thing differently… I had read that soaking chicken in buttermilk for a couple of hours makes it really tender and I had already started that way, so that was preparation before following your recipe. I’m not sure if it made it better or not, but it was SO good! I recommended it to my sister but told her she doesn’t have to make it sweet since she doesn’t like sweet meats. She’s always complaining that chicken breast is too dry. I think she will be pleasantly surprised by this! Thank you so much! That sounds delicious, Lana! I will have to try that next time. You can leave the sugar out of the rub and it’s still really good! The chicken was so juicy, it spurted juice when I cut into it! Wow! I loved how easy the recipe was (suits my simple tastes too) and how effective the temp/time/sitting-covered method was in making this is the easiest and most tender and yummy looking roasted chicken ever. Perfectly and evenly cooked too. I didn’t have onion powder so I threw 1 teaspoon of Montreal chicken seasoning in to sub. I like a bit more flavour than this combo delivered, so I’ll try it with onion powder next time, and now want to try other rubs or marinades cooked in this method. Otherwise thank you for all your research – you found the secret formula!! Didn’t love the paprika, but it was easy, fun to make, and deliciously juicy, as promised! I do not keep recipes — unless they are fabulous!!!!!!!!!!!!!!!!!! I am keeping yours and will use it when we are entertaining and want an impressive entree. Thanks for doing all the experimentation and giving directions so specifically to guarantee success!!!! It’s been such a long time since I baked chicken breast. But your tips & recipes are really tempting me to try them out immediately! It’s so wonderful, I’m pinning it for safe keeping, too. :D.
Hi Sarah! I’m SO happy to read your comment. So glad you all loved it. Thank you for your review! This was a delicious rub. I combined that with a cooking method i found for a pork chop recipe. I placed an oven-ready frying pan in the oven while it heated up to 450; once it came to 450, i pull out the pan and put it on the stove top put the chicken in and seared each side of the chicken. Then i put it back into the 450 deg. oven until the chicken was 165 degrees. I let them sit for 10 minutes, covered. So nice to find a recipe I love. A saver, for sure. I’m so happy you enjoyed! 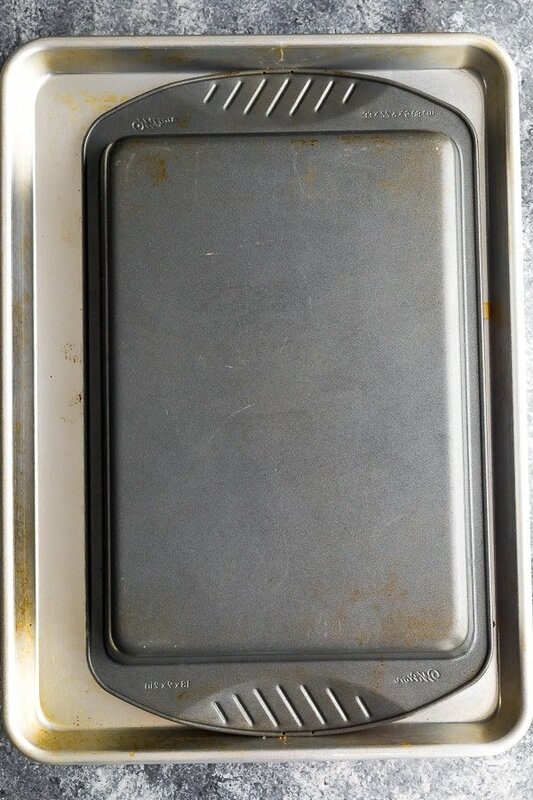 Love the idea of pre-heating the pan. That’s how I cook my salmon and it turns out great! I hope you enjoy it! Chicken is so easy to over-cook! This was great! 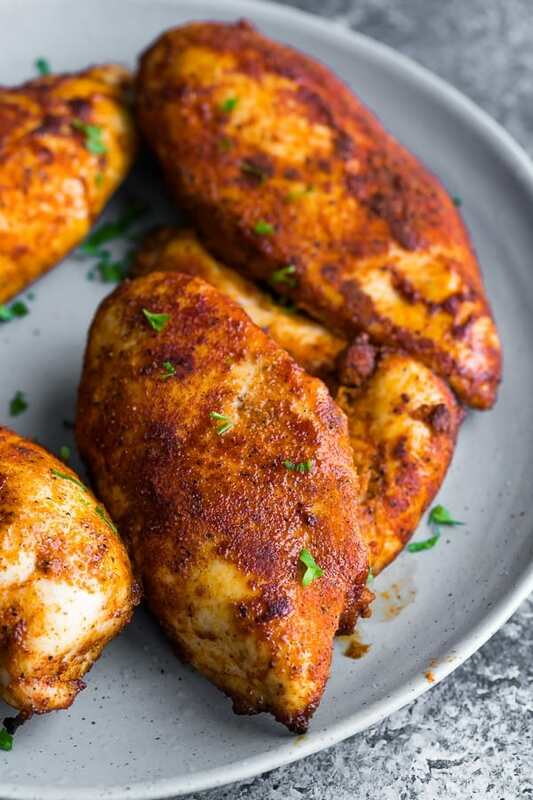 A couple of observations–boneless chicken breasts bake more evenly if you whack ’em a little to even out the thickness. Also, instead of the garlic powder, I steeped a couple of smashed garlic cloves in slowly warmed olive oil (and/or butter) for a few minutes. Strong fragrance, but subtle taste. So true! I need to get a mallet. Thanks for your review, Larry! No need to buy a mallet. A wooden rolling pin or an empty wine bottle will suffice quite nicely. Hi, I’m about to make some baked chicken breast tonight myself. I have a question for you; the chicken breasts in your pictures look like they’re skinless, boneless, breast pieces. The ones I’m cooking tonight are split chicken breast halves; they’re very large pieces, with the skin and bone. I’m only cooking 2 pieces, but even they weigh about 800 grams total (appr 1.76 lbs, I’m Canadian I weigh most everything in metric). I’m almost positive it’s going to to take a longer time for them to bake then the times listed in your recipe. I’m wondering if I shouldn’t also bake them at a lower temperature? They’re going to need a much longer time to cook then the boneless, skinless breasts; they might get overcooked, dried out, or even burned, if I cook them at 450°. Have you ever done this recipe with regular chicken with skin on and bone in? If so, would love to hear your results! By the way, thank you for the wonderful rub recipe as well! My uncle was just recently put on a cardiac diet for a heart condition; it’s been so hard lately finding foods I can make for him that meet his dietary needs. IE, low sodium, low fat, low sugar, etc. I don’t normally fry our chicken, it’s always baked, but everywhere you look there’s so much hidden sodium in the store-bought products we buy! I used to think shake & bake and seasoning salt was a godsend in my kitchen! Not anymore though; way too much sodium in both of them and some even have more than 1 type of sodium! if i were to use those ingredients now, I’d probably kill my uncle just with the salt alone, never mind all the chemicals that are in these products! Your recipe, and especially the rub mix, are a welcome addition to my kitchen. I can use that rub mix on other meats as well, or at least I’m going to try. I plan on using it to roast a turkey in the next month or so. Hi Lorna! I have not tried this recipe with bone-in skin-on chicken breasts, so I’m not really sure on cook time. This recipe calls for 450, so I think the temp would be fine…I’d check on them after 25-30 minutes and check using a thermometer. Good luck! I cooked two of them, 1.5 lbs each, boneless and skinless. Turned down to 425 then 20 minutes per side, plenty of rub on each side. Came out just right at 160 using meat thermometer. Let rest for 10 minutes then cut into thin medallions for use in chicken sandwiches and then froze flat in two 1 qt freezer bags with air pressed out a much as possible. I ate the tips of each one though while warm before freezing. Yum. Rub is nice, not overpowering. I did substitute 1 teaspoon of the paprika with 1 teaspoon of turmeric since that spice is quite good for the heart and body and not that much different in flavor from paprika, IMHO especially with the other spices involved. Yay! So happy you enjoyed, Alaiza! Yay! You totally made my day! So happy you enjoyed, Sara and thanks for your review. Hello Denise! Thank you for this wonderful tip. I am definitely going to try this for next week’s meal prep. Donna from Retirement Reflections recommended your blog to me, and I’m so glad she did! 3. The alarm went off at like 21 minutes. They look delicious–honestly, just like your picture. I am hungry and it is hard to wait for them to rest so I have already eaten half of the chocolate cake I set out for dessert. Wow, delicious! Really good. (The onions are dried and a little crispy. Not photogenic, but quite tasty.) Definitely the best chicken breasts I’ve ever made, although I am not a habitual cook. The pan is going to be hard to clean though, even though I sprayed it with olive oil spray. Thank you, Denise! Really appreciate this. Yay! I’m so happy you enjoyed them, Peggy! And I need to get myself one of those oven thermometers…you just leave it right in the chicken as it bakes? Genius! I’m going to check out a thermometer like that too! Thanks Peggy. Yeah, it’s amazing. There’s a coated wire that you just let feed out of the oven. Keep the control piece on the counter, not the stovetop, as it’s not supposed to get hot. Mine is an Accu-Rite, I think it was $10 at Walmart. My mother (age 87) thinks it’s black magic. Your baked checken breast is so delicious. Your baked chicken breast is so delicious. Can’t wait to try these, as well as many more other listed, love the video’s as well as the optional choices, the BEST user-friendly site around !!! Thank you so much! I hope you enjoy the recipe! This was awesome! I omitted the sugar, because I didn’t want a sweet taste, but otherwise followed the recipe exactly. I may have cooked my chicken too long – I went with the longer cooking time without checking the weight – because the internal temperatures were around 190°, but the meat was still moist and delicious. Thank you for this recipe. I tried this with a marinade; it did not work – it coked too hot and the marinade burned in the dish and set off the smoke alarms in the house. Next time, I’ll try it with a dry rub. Would I need to modify the bake time if I’m adding more chicken breasts? Let’s say, I want to bake 6 instead of 4 or even more. Hi Janae! Nope you can keep the cook time the same. Make sure not to squish them together on the pan and they should cook exactly the same. Hope you enjoy! Love the rub ingredients! Easy to prepare as they are like staples in every kitchen. Pinned this tasty recipes!! Can you freeze the chicken after cooking, had too much chicken but had to cook it. Sorry, I jusr read that you can freeze it. Very helpful, thank you! My chicken turned out perfect . So happy to hear this! Thanks so much for your review, Christina! Thank you so much! I have been over cooking chicken breasts for years, but not any more! Delicious and juicy and my husband (who usually does the cooking) loved it! THANK YOU! I have been making chicken for over 25 years and this is the best recipe! Easy and the chicken is flavorful and juicy. This recipe was fantastic! Perfectly cooked, juicy and tasty. I wouldn’t recommend this the chicken comes out under cooked. I had to put it back in the oven thankfully I took the first bite or my family would’ve gotten sick. Jolly, This could be avoided by using an instaread thermometer. 165 degrees for chicken. Your chicken being undercooked has nothing to do with the recipe. Cook time for any cut of meat can vary depending on type and size, so it’s important to check the internal temperature. Check breast size varies greatly. also varies with ovens.. ive noticed this sharing recipes with friends.. Not sure if its a difference between gas & electric? mines cooking right now…..according to my oven lol mayb 15mins on each side at the recommended 450. . we shall see…so far my house smells incredible…. This was the best chicken I ever baked! Wow, huge compliment! Thanks so much for your review, Jacquita! Best chicken I’ve ever cooked, thanks! Any tips on reheating cooked chicken breast without drying it out? I live alone, and cooking one serving of everything seems like so much effort but I always find that meat gets so dry when it’s reheated for leftovers. Chicken breast is hard to reheat! I find my chicken breast keeps really well if I refrigerate it overnight before slicing. You could reheat the sliced chicken in a frying pan over low heat (cover), but your best bet is probably going to be to add some sauce to it. Hope this helps! This looks perfect indeed, I’m looking forward to make it at home. Thanks so much, Isadora, I hope you enjoy! I’m so happy to hear this Julie! Thanks for your review! What a delicious recipe! I tried it today with bone-in breasts and the timing was perfect. They were succulent and tender, and cooked just right. I’m done trying to figure out how to bake tasty chicken breasts. This is my new go-to recipe. Thank you so much. I’m really happy to hear it worked well for bone in chicken breasts as well! Thanks so much for taking the time out of your day to leave a review, Mary. 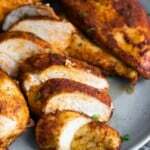 This method really does make tender and flavorful chicken! I look forward to using this cooking method to make many different chicken dishes. I’m so happy to hear this! Thanks so much for your review, Gina! I’ve got a question what if you use thinner chicken breast should you still cook it at the 450 degrees? Hi Beatris! I would still cook at 450 but take it out early…I’m not exactly sure on the cook time since I don’t know the size of your chicken breast. I wish I could be of more help! Could this method be used with bone in chicken breasts? I made this last night with a boneless breast and it was the best and most juiciest white meat I have had! I usually go with dark meat as I have never been able to make a juicy version of the white meat. But this recipe was a HIT! Hi Tara! I bet it would work great with bone in, however I haven’t tried and am not sure on the cook time. I wish I could be of more help 🙁 PS- glad you enjoyed it with the boneless breasts! Im going to make this tonight and cant wait to try the spice combination!! First time baking chicken breasts and they turned out great! Thanks! 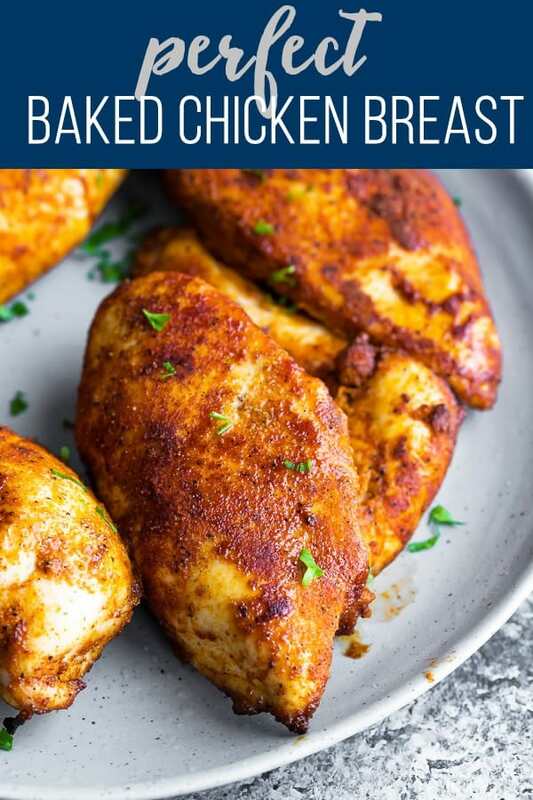 This is the best guide I’ve read on baked chicken breast. Thank you so much! It’s my go-to now. Looking for a quick, easy chicken breast recepe- try this one. Followed the directions and it turned out exactly as described. Probably the most juicy chicken breast I’ve ever cooked. Really enjoyed the discussion regarding the experimental process to arrive at this recipe. Thanks so much! Hi Dave 😉 So glad you guys enjoyed it! Thanks for taking the time to leave a review. WOW! 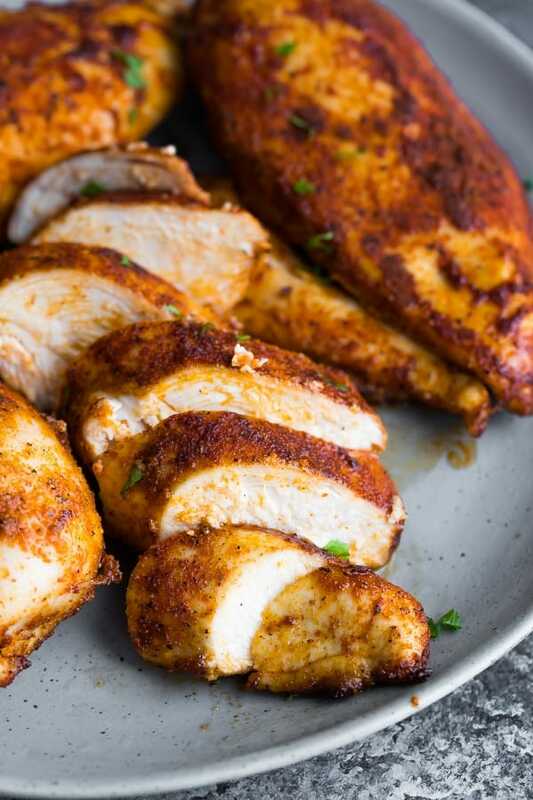 I prepared this for my husband and teenage son- I liked the recipe becuase it seemed simple to prepare but the comments that followed (“Mom, this is amazing” and “This chicken is sooooooo juicy and tastey” made me REALLY like it!!! Thanks for your site- I can’t wait to discover your other recipes! Im looking for a simple recipe. I see this page and click. As Im trying to scroll down I get 4 separate pop ups asking me to register, get notified, my location. Then I try to rool down and there 20 pictures loading delaying the process. Then theres a lecture about how not to waster aluminum foil. All I want is the recipe. Hi Scot, sorry to hear you had a bad experience. FYI there is a ‘jump to recipe’ button at the top of all my posts so you can skip past all photos and go right to the recipe. Also, the ‘location’ pop up would have nothing to do with my site, that is likely your browser. Anyway, thanks for your feedback, I’m always trying to improve the user experience. Have a great day! 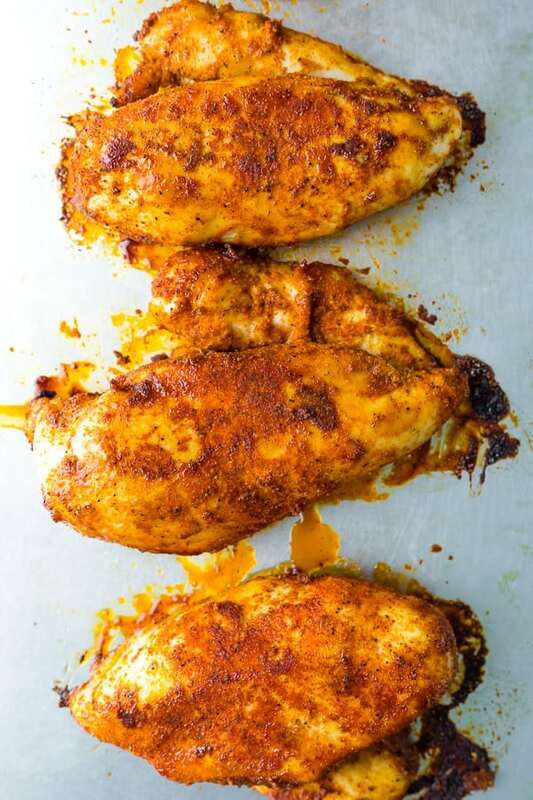 I recently made a baked chicken breast recipe that was so good and so tender. I was telling my boyfriend how juicy and good it was. Very similar to you recipe but at 425. I must try the 450 and your spice mix, looks so tasty! I hope you give it a try, Tracey! Thanks so much! So happy you enjoyed, Olga! Thanks for taking the time to leave a review! wow this looks very delicious, i like it and i love chicken breast thanks for sharing this post. How timely! I was just googling how to bake chicken breasts the other night. I had 6 chicken breasts (from a box) that were glued together, so I had to defrost it all.. Then wondering how to bake it so it doesn’t go to waste and the answer was in my email the next day. My chicken was juicy & cooked perfectly. I used lemon & rosemary olive oils to bake it with. Thanks for the tips- especially about covering the chicken breasts to rest.. HUGE difference. I now have lovely cubed chicken ready to be used. I may actually do a batch of these and freeze them since it’s so easy to use sliced chicken that’s already cooked and ready to go.